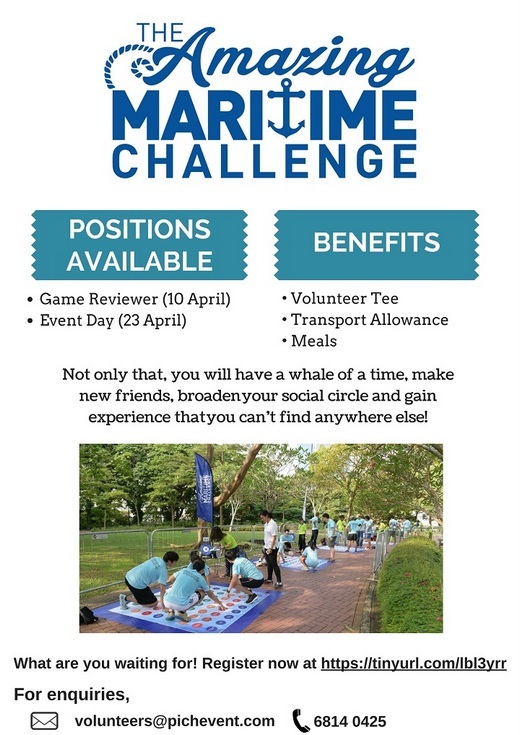 The Amazing Maritime Challenge 2017 (AMC 2017) is an adventure race where 600 teams of 2 compete mentally and physically across Singapore to complete a series of games designed to help them discover more about maritime Singapore. AMC 2017 is organised by the Maritime and Port Authority of Singapore, in conjunction with Singapore Maritime Week. Not only that, students will have a whale of a time, make new friends, broaden their social circle and gain experience that they can’t find anywhere else! Volunteer registration is now open and closes on 14th April 2017! For enquires, feel free to email volunteers@pichevent.com or call 6814 0425.